Conn ‘Transitional’ Art Deco-engraved Alto Original Silver, Overhauled! 1930’s transitional Conns deserve their reputation as quintessentially loud, warm, projecting lead altos for jazz and beyond. This one is beautiful, already restored, and ready to go. This rare variant of the Conn “Transitional” tenor saxophone has both the “Naked Lady” engraving and split bell keys. This saxophone has just been overhauled by Matt Stohrer- who removed the original pads! That means this is about as clean a vintage Conn tenor as you’ll find. Beautiful, clean Conn 10M tenor from 1941, overhauled by Matt Stohrer. This is the one to get. This is a beautiful Conn 10M Tenor from the best vintage! It also has a fresh overhaul and it’s priced to sell! Conn 10M Silver Tenor Saxophone 311514 Overhauled! This is a nice original lacquer Conn 10M tenor SN 271xxx. The original lacquer is about 95%, and the horn looks great with no dents or dings. People love 10M’s because they have a big, warm, complex, dense tone but they also have more focus and delicacy than the earlier Conn tenors. Ergonomically, the design is actually very good, and the keywork is nice and fast, though it is a different design from Yamaha/Selmer and takes a period of adjustment to get back up to speed on if you’re used to burning fast bebop passages. But you can certainly play fast on this keywork design, just as Charlie Parker and Dexter Gordon did, and a host of modern players do. 1939 was arguably the single greatest year for saxophone-making, and this beautiful 10M hails from that golden era. It is in remarkably fine condition, with even its original factory pads still intact! It has had a few dents removed over the years, notably one on the bell, and a few other small ones, but it’s in great shape overall, and will look even better with an overhaul. If you’re looking for a nice, clean 10M to buy and get overhauled, this would be a great option. It’s priced competitively to give you room to do great on it even with the repad it needs. This is a nice, prime-vintage, Conn 10M tenor from 1941. It has rolled tone holes. It is in good physical condition, but the pads are old, so it needs an overhaul. The neck is unlacquered and is from a 10M of the same vintage, so it’s the correct neck and works fine. The engraving is nice and sharp, but I think it is a really really good refinish. In the interest of erring on the side of caution, I’m pricing it like a relacquer. Basically, this is a chance to get into a Conn 10M (which is a serious contender for best tenor tone ever) for not much money and get it overhauled yourself. It has a few small dents, but nothing difficult for any good tech to deal with. It ships in an old Conn case, or you can upgrade to a BAM Softpack or Hiscox case for a discounted amount. Conn 10M Tenor from 1935 269169 Fresh Matt Stohrer Overhaul! From my small personal collection. This is my reference for what an exceptional Conn 10M tenor should be. It has a fresh, high-end overhaul by Matt Stohrer. Best of the best folks. Don’t let your friends play it, unless you want to ruin their day. Super clean original pads Conn 10M tenor. This is a beautiful Conn 10M tenor that played in World War II. It’s being sold by the son of the original owner, who bought it to take to Hawaii with him where he was stationed during the war. This is one of the last of the ‘pre-war’ Conns, and it’s a great vintage. I have one like this in my collection also. Nothing plays like a Conn, and this is a chance to get a nice clean one for a low price. The Conn 10M ‘Naked Lady’ Tenor has a tone that is hard to beat. This one is priced low solely because it has a later serial number. It still plays great and is a great value. Great deal on a good looking Conn tenor. This is a remarkably clean original lacquer, original *pads* Conn 10M tenor from 1946. It includes the original case, original mouthpiece and ligature, end plug, the works. Not often have I seen a 10M that was this close to pristine condition. At SN#319xxx it has rolled tone holes and all the features of the early 10Ms. Obviously, since it has pads that are 70 years old, it will need a repad if you plan to play it a lot. It actually does still play surprisingly well for having its original Conn pads, and hey, ‘it’s only original once’ so might as well leave it this way for now. This serial range is favored by some of the pickier Conn players I know as producing especially good playing 10Ms. As for me, I have found the 10Ms with rolled tone holes to play remarkably consistently and well when they have a good setup. This beautiful original lacquer Conn 10M tenor is in good condition and ready to play right out of the case. It just had a tune up, and it has a mix of older and newer pads. It plays just how you would expect, with that big, medium dark, room-filling Conn tone that everyone loves! This horn is not pristine, but has been played some, and has a few past repairs: there have been a few small dents removed on the back of the bow and bell, one by the lyre holder, and one from the side of the neck, all clearly pictured below. One post by the G# has been resoldered where it popped off. These are just run-of-the-mill vintage saxophone repairs and not serious, but I mention them so you know just what you are getting. The horn is beautiful, and you don’t notice this stuff unless you look quite closely. Pre-war 10M’s in good physical and cosmetic condition are getting harder to find, and this one is priced on the lower side for a quicker sale. It includes the pictured Pro-Tec case as well. The Conn 10M is one of the best tenor saxophones ever made, and this is a nice example from the prime serial range. If you have been looking for a good Conn to play, this would be an excellent choice. Only one available! Beautiful original lacquer Conn 10M Tenor. It has old pads and needs an overhaul. This is pre-war, from 1940, the most desirable vintage of 10M. Nothing plays like one of these, and the keywork is remarkably comfortable and fast, once you get used to it. Tunes well too! This is a super clean silver plated Conn Transitional tenor saxophone SN# 256xxx with split bell keys and naked lady engraving. This particular iteration of the transitional Conn is very rare and highly desirable. The naked lady engraving is almost always on the 10M-style horns, but there was just a short period in which they still made split bell key versions but put the new engraving on them. As I already mentioned, the sound is really big on this horn. As soon as you start playing, it comes alive, and the body tube resonates in your hands. The intonation is pretty good, and the not-so-comfortable keywork will fade into insignificance because you will love the sound so much. There is not too much more to be said about this horn, except that whoever gets it is going to be one happy person. This is a very early 10M style transitional tenor. It will be a really good deal for the money for somebody, I think, because it has been relacquered very gently without causing much in the way of mechanical problems on the horn. The lacquer is the correct kind and color to be original, so the horn looks really good. It plays like most 10M’s, with a big-yet-focused tone that is dark, fat, and powerful. The reason to buy one of these is that the sound is like nothing else made then or since. With one of these horns, you get more tonal colors to work with on your pallette. It’s as simple as that. The Conn 10M tenor is easily one of the best vintage tenors made. It combines excellent intonation and comfortable keywork with a big, warm tone that remains focused and powerful. The earlier ones with rolled tone holes like this come from the time when Conn’s manufacturing prowess was the best in the world, making these some of the best-constructed saxophones ever. Again and again I am amazed at the quality that this factory’s skilled craftsmen achieved from the mid 1920’s through the mid 1940’s. Lots of players all over the world seem to be moving from modern horns to vintage Conn tenors specifically, because they are looking for a bigger, more complex and rich tone. This horn easily blows away any modern horn tonally. This is a very clean original lacquer Conn 10M tenor. It has about 96%+ of its original lacquer and is all original, with original factory pads and original case. This price INCLUDES an overhaul by Matt Stohrer done to your specifications. If you want it as-is, I can discount the price significantly! More pictures coming soon! This is a very clean original lacquer Conn 10M tenor. It has almost all of its original lacquer. This horn is gorgeous and has been played very little since it was new. There is hardly any wear on it – just a few touch points like the octave key and palm keys. The bell engraving looks particularly nice – this is about as close to new-looking as you will see the engraving on a 10M. It is one of the best 10M’s that I have played, and I’m actually thinking of holding onto this one as a reference Conn tenor for people to try when they want to know what a good 10M plays like. Lots of guys all over the world seem to be moving from modern horns to vintage Conn tenors specifically, because they are looking for a bigger, more complex and rich tone. This horn easily blows away any modern horn tonally. This is a very clean original lacquer Conn 10M tenor. It has almost all of its original lacquer. This horn is gorgeous and has been played very little since it was new. There is hardly any wear on it. Lots of guys all over the world seem to be moving from modern horns to vintage Conn tenors specifically, because they are looking for a bigger, more complex and rich tone. These horns easily blows away any modern horn tonally. This is a relacquered Conn 10M from the most desirable serial range. It is a good-looking relacquer job without much buffing. The reddish color is from the high copper content of the brass in these early 10M’s, and is part of what contributes to the great tone they have. If you have been wanting a 10M for a while, but you are on a budget, this horn should play just as well as an original lacquer 10M with a good mechanical overhaul. There’s nothing like an early 10M with rolled tone holes and that big, warm, Jazz era tone. The keywork is fast and comfortable, and the intonation is typically very good. This is one of my favorite models of saxophone bar none. Get it now for a bargain price and start enjoying it! If you read around on this site you will see that I have a very high opinion of vintage Conn saxophones. Conn made AMAZING saxophones during its prime years of 1925-1945, during which time the Conn factory was the largest (and arguably best) musical instrument factory in the world. The professional models of these “prewar” Conns are extremely well-made, and they are simply a joy to play. This horn is a pro Conn “Artist” 10M tenor saxophone that is in just about as pristine condition as a person is likely to find. It has nearly all of its original silver plate finish, and it has beautiful hand engraving on the bell, featuring the famous “naked-lady” portrait. This horn still has its original factory pads and factory setup, even the warranty card, and the original case is still very nice, though you might want to add a protective, modern case for safe shipping. This is a beautiful, original silver Conn 10M tenor. This horn has almost all of its original silver plate intact and has not been played much at all. It also has a recent repad that was done before it came in on consignment. Lots of guys all over the world seem to be moving from modern horns to vintage Conn tenors specifically, because they are looking for a bigger, more complex and rich tone. The only drawback is that you have to spend a couple of weeks getting used to the non-Selmer-style keywork. It is quite fast keywork once you’re used to it, and it’s well worth the adjustment period. This beautiful WW2-era 10M has almost all of its original silver plate intact and has an excellent, recent overhaul. This horn plays like a good 10M should, with a big, dark, fairly focused core tone that is a joy to listen to. It’s in the prime serial range for 10Ms, and in this kind of playing condition, should make someone very happy for a long time without needing much maintenance at all. This is a solid horn for the money and is totally ready to go, playing condition wise. This is a rare silver Conn 10M tenor with rolled tone holes. Lots of players all over the world seem to be moving from Selmers and various other modern horns to vintage Conn tenors specifically, because they are looking for the bigger, more complex and rich tone that the Conn gives you. The only drawback is that you have to spend a couple of weeks getting used to the non-Selmer-style keywork. It is quite fast keywork once you’re used to it, and it’s well worth the adjustment period. This horn plays like a good 10M should, with a big, dark, fairly focused core tone that is a joy to listen to. It’s in the prime serial range for 10Ms, and in this kind of playing condition, should make someone very happy for a long time without needing much maintenance at all. This is a nice late transitional 10M tenor with original lacquer. This is one of the last “transitional” 10M’s, since the 10M stamp above the SN# started around 276xxx. These horns are really really great players with a big, rich, dark tone that is medium-spread, but more focused and under-control than a New Wonder II. They also have really fast, comfortable keywork (once you stop trying to make them be a Selmer and let them do their own thing). The intonation is also good. What more could you ask for in a vintage tenor? This is a good deal on an original lacquer 10M. Playing wise, this horn plays pretty well on older pads. I bought it from a player who was using it, so it’s not bad if you want to just play it as is. But I always tell people that it is best to repad horns that have older pads because then you get the horn’s full potential. So although it does play, plan on getting this horn repadded soon. The tone is classic 10M – big, rich, full, powerful if you push it, sweet if you hold back. It is also hard to beat 10M keywork for speed, and you Selmer guys out there will get used to the ergonomic differences if you give it a few weeks. Silver plated 10M’s are rare and highly desirable. There are no dents or dings or resolders on the horn, and the bell, body tube, and bottom bow are all clean. This sax has a mix of older and newer pads and they are sealing very well, so it does not need an overhaul at present. The tone is classic 10M – big, warm, somewhat spread, but with a controllable core to it as well. The keywork is not modern, but it was designed well, and it is very fast, and it doesn’t take long to get used to it. People are still playing these horns from the 30’s and 40’s because they are works of art, and monuments to American craftsmanship, but most of all because of the tone. If you read around on this site you will see that I have a very high opinion of vintage Conn saxophones. Conn made AMAZING saxophones during its prime years of 1925-1945, during which time the Conn factory was the largest (and arguably best) musical instrument factory in the world. The professional models of these “prewar” Conns are extremely well-made, and they are simply a joy to play. It’s a gorgeous horn in the prime serial range for a Conn transitional. There is no past damage, and there are no past repairs of any kind. It is near mint condition, even though it is 75 years old! When they are this clean, you know that you are getting the experience of what one of these really should be like. Conn 10M Transitional Tenor Art Deco Silver Overhauled! Best of the best type of Conn from the ideal vintage for the quintessential 30’s jazz powerhouse. Beautiful and rare art deco silver plate original finish, fresh overhaul! This has it all. There’s some lacquer missing on the bell where the owner picked up the horn the same way every time. Worn spot on the bell. Worn spot on the bell. Worn spot on the bell. OK now you’re desensitized to it. This is one of the best horns on the site at present. Conn 10M Transitional Tenor Saxophone 250009 Art Deco Silver Plate Recent Overhaul Outstanding! This is a very nice condition Conn New Wonder II tenor, built in 1932, among the earliest of the “transitional” series with art deco engraving and raised side E key. It is in its original silver plate, and has a recent mechanical overhaul on it that was very well done. This tenor is tight and slick and snappy and not mushy under the fingers (as can sometimes happen to Conns with less-than-stellar overhauls) and has the simply unbelievable enormity of tone that even now, after having owned and played about as many saxophones as anyone else, still surprises and delights me when I pick up a Conn. As a repairman friend of mine is fond of saying “I am not prone to hyperbole, but I could go to court and win the case that Conn has the biggest tone.” If you haven’t had a chance to play a 1920s-1930s Conn, you simply haven’t seen all that the saxophone can do. A good Conn is a truly astonishing instrument, and it is easy to see why so many of the professionals of the era favored Conns. If you need to project to the back of a dance hall in the age before amplification, a Conn is the way to go. And because so many professionals of the golden age of big band and jazz played Conns, it is not common to find one in clean shape- and although almost anything can be fixed in the right hands, I find it better to start with a clean example when possible, even (perhaps especially) when being fixed in the right hands. And this horn fits the bill- straight, not abused, not refinished, not overly worn, and well overhauled. 85 years old and ready to play out of the case, putting other horns to shame with its undeniably massive tone. This is a great horn, and whoever buys this one, your neighbors 3 houses down are going to know when you make the switch. This is a beautiful original split bell keys transitional 10M. These are really great playing horns, and some of the earliest lacquered Conns to sport the naked lady engraving and the beginnings of 10M keywork. That makes them hard to beat. They are also extremely hard to find in original lacquer, as this horn is. This sax has older pads, and although it currently does play very well, it will need a repad fairly soon, if you play it a lot. If you are in the market for a truly great 10M, you have come to the right place. I have spent the last several months trying to find a handful of great vintage Conn tenors, and this is one of them for sure. It is a late transitional 10M (notice no 10M stamp by the serial number quite yet) and it is original lacquer. This horn is set up for a serious player, with the modifications that everybody does to these horns for better ergonomics– namely, the strap ring has been moved for better balance, and the thumb hook was replaced with a more comfortable one. Other than that the horn is stock. This is a silver Conn Transitional 10M Tenor Saxophone in excellent Condition with a fresh repad and flat metal resonators. This is a gorgeous horn with no dents or dings or resolders. It has split bell keys and the 10M naked lady engraving. Almost all the original silver is intact, and the horn looks gorgeous. It has just been cleaned and fully repadded by an experienced tech who does excellent padwork. The pads are MusicMedic with flat metal Conn-style resonators. The split bell keys transitionals are the best of the Conn tenors by all accounts, and this horn is no exception. It has a HUGE tone that is warm and will fill up a room effortlessly. This is a BEAST of a Conn 12M baritone from the super-desirable Mulligan / Carney prewar 12M years. (This one is 1930.) This had a recent repad by Matt Stohrer and plays great. This is probably the rarest saxophone on GetASax.com at present. It is a 12M baritone with rolled tone holes, which is rare enough. But this one is in original nickel plate. I have never heard of another nickel plated baritone in this serial range. On top of that, almost every nickel plated Conn has no engraving, and this one has the full regular 12M engraving on it. It may be one-of-a-kind. On top of that, people who have played a lot of Conn saxophones know that the nickel plated ones are special. They have more power and ‘bark’ to the tone than any other Conn. It is pro-quality in every way and should satisfy any bari enthusiast looking for the best possible vintage tone. The tone is huge, warm, spread, and powerful. This horn will burn all the way up into the palm keys without losing the fatness in the tone. Nothing sounds like a Conn.
Conn 12M Transitional Baritone Nickel 235xxx Great Deal! This is a BEAST of a Conn 12M baritone from the super-desirable Mulligan / Carney prewar 12M years. (This one is 1930.) The pads are all new, and this thing just screams on them. This is a good example of a Conn transitional 12M baritone saxophone. It has just gotten a fresh repad done by Matt Stohrer and it plays really well. For the repad, Matt used precision pads and screw in (reusable) domed brass resonators (which cost $100 themselves!). It feels very snappy under the fingers and plays effortlessly throughout the range of the instrument. I can’t seem to keep one of these around, however hard I try. Probably because they are just incredible horns with a huge, warm, rich tone that is really impossible to get on any other horn. Check out Gerry Mulligan or Harry Carney, or a host of modern players if you want to see what this horn can do. It’s also a very light horn, and feels much more like a tenor than a baritone in your hands (or around your neck!!). Conn 26M Alto Connqueror from 1937 Near Mint 30M-style Neck Warranty Card! This is the nicest 26M that I have ever had for sale, It is the most desirable version with the very rare 30M-style neck. Original lacquer, no past repairs, no damage, original pads, original warranty card! For the Conn-enthusiast (and I am one big time) this horn gets those dopamine receptors firing at full strength. Conn 26M Connqueror Alto Original Silver! This is only one of only two original silver plated Conn 26M altos that I have ever seen. Most silver Connquerors were replated back in the 90’s and early 2000’s. This one is the real deal. It has just received a full overhaul done by saxophone repair maestro Aaron Barnard. Conn 26M Connqueror Alto Saxophone 271xxx BIG Conn tone! Well, here is a horn that is super-incredibly-vanishingly rare. It’s a transitional Conn 8M C Melody. For those of us who care about the C Melody saxophone, this gets our blood pumping. There are only a handful of these horns out there, in all likelihood, and this one has to be one of the nicest, because it’s in virtually mint condition including the original case. The Conn Connqueror is the most super-deluxe saxophone model that Conn ever produced, and is at least a strong contender for the pinnacle of American saxophone manufacturing. Desired by players and collectors alike, these rare saxophones come up for sale only infrequently. This particular horn is a time capsule that was discovered sitting across two rafters in an attic in Tennessee, just before an ancient farm house was torn down. In his haste to see what was inside, the excited person who found the case broke the latches. I am told that they can be fixed if you wanted to restore the case, which is in otherwise great shape. This sax had been waiting patiently up there as the decades flowed by in the rooms underneath, people moving in and out, children growing up and having their own children, until finally it was found. It is in totally original condition, with all the factory setup intact, including all the factory pads. Crazy fully-engraved GOLD plated Conn 30M tenor artist-owned. Only one available! Includes a primo Hiscox case also. As I’m sure you know, the 30M was the top of the line saxophone that was made by CG Conn. It’s everything you like about a 10M, but more so. It has rolled tone holes, and everything that your hands touch is either pearl or solid silver. This is a very clean saxophone, with no dents or dings anywhere. There are no resolders either. There are no past repairs that I can see. The original neck has not been pulled down. It has had a pickup removed by TenorMadness. They are the best in the world, and this neck is now 100% good as new. The repair is so perfect that it matches the neck inside and out 100%. See the pictures below. The original lacquer is almost all present. It has really nice elaborate engraving. There is almost no lacquer wear on the bell. This is a Conn 30M tenor that actually plays on its older pads, (which, by the way, appear to have a set of desirable Selmer Tone-x domed metal resonators on them) but which has definitely been around the block. It has had numerous posts resoldered, and it has been relacquered. If you’re wanting a 30M in the best serial number range (291xxx) at a low price, this is it, but it will need some major love as well, if you want it to play its best. Conn 30M Original Pads Original Lacquer Nicest I have seen – Mint! Conn 30M Tenor Connqueror Original Lacquer Fresh Overhaul Great! This is among the nicest 30M’s that I have had for sale in a long time! It has a fresh high-end overhaul! There is nothing like a Conn 30M for beauty, build quality, and a big, powerful Jazz Era tone. In my opinion, if you can get a nice vintage Conn to play, you should. Conn 30M Tenor Near Mint Original with Matt Stohrer Overhaul! This is among the nicest 30M’s that I have seen. It came in with original pads from almost 75 years ago, and after a full overhaul by Matt Stohrer, it turned out to be an outstanding player. There is nothing like a Conn 30M for beauty, build quality, and a big, powerful Jazz Era tone. And despite what you may think, the keywork on a 10M/30M is actually very fast when properly setup. In my opinion, if you can get a nice vintage Conn to play, you should. This is a nice early 30M Tenor Saxophone with a fresh overhaul done by Aaron Barnard. Aaron used pisoni premium pads and TenorMadness domed metal resonators, and the horn feels very good under the fingers, and plays GREAT with a big 30M sound. This horn has been relacquered gently at some point. Note that the engraving still looks very good. There is no sign of heavy buffing anywhere on the instrument, and all of the rolled tone holes look just like they would on an original lacquer Conn. This should be a great deal for someone who wants the best vintage Conn 10M/30M tone for the money. Conn 30M Tenor Saxophone 274xxx Original and Nice! The Conn 30M is the most super-deluxe saxophone model that Conn ever produced, and is at least a strong contender for the pinnacle of American saxophone manufacturing. Desired by players and collectors alike, these rare saxophones come up for sale only infrequently. This particular horn has a recent overhaul (not sure who did it), and the work feels good under the fingers. The pads are in excellent shape and have not been played much. The tone is classic 10M/30M Conn, which, if you have never played one, is hard to describe, but is big, dark, full, complex, with power when necessary, but easy to play softly as well. More focused than an older Conn, but more spread than any modern horn, able to fill a room easily. Dexter Gordon got his signature tone first of all by being Dexter Gordon, but his Conn 30M (and sometimes 10M) together with a vintage Dukoff Hollywood helped quite a bit. Conn 30M Tenor Saxophone 279xxx Overhauled! The Conn 30M is the most super-deluxe saxophone model that Conn ever produced, and is at least a strong contender for the pinnacle of American saxophone manufacturing. Desired by players and collectors alike, these rare saxophones come up for sale only infrequently. This particular horn has a recent overhaul, and the work feels good under the fingers. The neck is from a later Conn but it is the correct bore, done by master saxophone repairman Aaron Barnard. The tone is classic 10M/30M Conn, which, if you have never played one, is hard to describe, but is big, dark, full, complex, with power when necessary, but easy to play softly as well. More focused than an older Conn, but more spread than any modern horn, able to fill a room easily. Dexter Gordon got his signature tone first of all by being Dexter Gordon, but his Conn 30M (and sometimes 10M) together with a vintage Dukoff Hollywood helped quite a bit. This is easily the nicest 30M that I have ever seen. It’s in mint/near mint condition and is SN# 292xxx. It’s original lacquer, of course, and it has all of its bits and bobs intact. The pads have hardly been played on since they were replaced, but I am told that this was around 25 years ago. It comes in the original case, which looks as good as the horn itself. The Conn 30M is the most super-deluxe saxophone model that Conn ever produced, and is at least a strong contender for the pinnacle of American saxophone manufacturing. 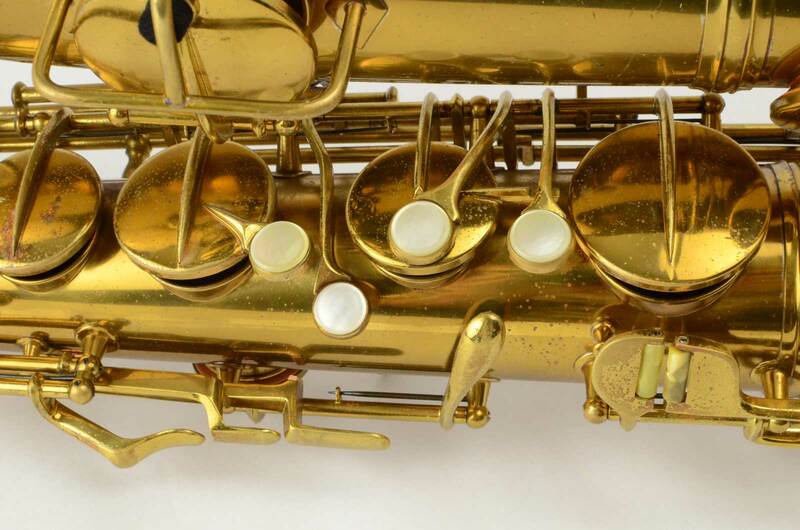 Desired by players and collectors alike, these rare saxophones come up for sale only infrequently. There are no past repairs at all on this horn. The original neck is perfect, there were no dents removed, no resolders. It’s one of the cleanest vintage Conns that I have seen. It is original lacquer, aged to a dark molasses color, and there is barely any play wear to speak of either. The keywork is perfectly tight, and everything is just as it should be. Comparing it to an original factory setup 30M I have in the closet, I would say that this horn is just as it should be, or even better. The Conn 30M is the most super-deluxe saxophone model that Conn ever produced, and is at least a strong contender for the pinnacle of American saxophone manufacturing. Desired by players and collectors alike, these rare saxophones come up for sale only infrequently. This particular horn has a recent overhaul, and the work feels good under the fingers. The tone is classic 10M/30M Conn, which, if you have never played one, is hard to describe, but is big, dark, full, complex, with power when necessary, but easy to play softly as well. More focused than an older Conn, but more spread than any modern horn, able to fill a room easily. Dexter Gordon got his signature tone first of all by being Dexter Gordon, but his Conn 30M (and sometimes 10M) together with a vintage Dukoff Hollywood helped quite a bit. This is a rare Conn 30M Tenor saxophone in silver plate. It has the special engraving that only the silver plated 30M’s have, which is different from either of the two main patterns that the lacquered 30M’s had (pre and post 285xxx approximately). One big difference with the plated ones is the multiple pentagons above the lady engraving. I got this horn from the original owner, who lives just outside Elkhart, IN, whose wife special-ordered it from Conn. I have seen other unusual, special ordered Conns that had no serial number, and this one fits that bill. There is no stamp at all under the thumb hook, and no sign of anything having been there. Cosmetically, virtually all of the original silver is intact. This horn needs a full overhaul and is currently waiting in line for one by Matt Stohrer. This is among the nicest 30M’s that I have seen. It came in with original pads from almost 75 years ago, and after a full overhaul, it turned out to be an excellent player. There is nothing like a Conn 30M for beauty, build quality, and a big, powerful Jazz Era tone. And despite what you may think, the keywork on a 10M/30M is actually very fast when properly setup. In my opinion, if you can get a nice vintage Conn to play, you should. This horn pre-sold off our wait list, like many horns that come in. Conn 6M ‘Transitional’ Alto Original Silver Plate Stohrer Overhaul! Super example of a golden age Conn alto with a fresh Matt Stohrer overhaul. Wow, this is a clean, first year Conn 6M alto in outstanding original condition. If you have been looking for one of these to buy and get repadded, this would be very hard to beat. It’s super clean, beautiful, and undamaged. Nearly pristine. Grab it now, including the beautiful original case. Add a BAM Softpack to keep it safe in shipping, and I’ll give you a 25% discount on the case. I personally play an alto much like this one, and this is in my opinion the best vintage for Conn altos. They play bigger and take the lead alto role more readily than any other vintage alto bar none. And Conn saxophones remain the saxophones with the best reliability and build quality ever. Email if you have any specific questions about this horn. I’d love to talk to you. This is a Conn 6M VIII alto saxophone SN# 304xxx (1942) with the VIII stamp on both body and neck. Although it looks like original lacquer, it is a well done relacquer job that managed to preserve virtually all of the original engraving, including the fine details. There is no evidence of heavy buffing and all of the tone holes look good as well. The 6M alto has a great tone – big, warm, powerful, but without being out of control. You can fill a room easily, but the tone also still stays under control if you want it to, moreso than the earlier Conn altos. The 6M’s also have excellent intonation and can even work for classical playing. But they are built for jazz and big band, with the fastest keywork of any saxophone and a tone that really suits the 40’s vibe. This is a beautiful, all original 6M alto. It has nearly all of its original lacquer intact, and it even still has its original pads from 1947, making it just about as near to buying a new Conn alto as one could hope for. The serial is 320xxx which means it still has rolled tone holes. It is a gorgeous horn and is structurally very clean. This horn will play a bit on the current older pads. It is collectible like this, or with an overhaul, it would play HUGE. Conn 6M Alto Saxophone Near Mint Original Silver Plate Ser# 268xxx This is one of the most beautiful Conn alto styles from the best serial range for Conn altos. It is technically a late late transitional 6M, but I have a copy of the original sales receipt from the original owner, and it was actually sold as a 6M back in the early 1930’s. This horn has been well taken care of. It’s huge, powerful, and will easily fill up a room. This is a great lead alto for jazz, though I have also heard people swear by these for classical repertoire as well. It’s hard to be the slickness of the 6M keywork. The intonation is excellent as well. So for less than the price of a used Yamaha, you’re getting one of the best saxophones ever made, and certainly one of the very best ever made in the USA. This is one of the most beautiful Conn alto styles from the best serial range for Conn altos. It is technically a late late transitional 6M, but I have a copy of the original sales receipt from the original owner, and it was actually sold as a 6M back in the early 1930’s. This horn has been well taken care of. It has no dents and no resolders. The original neck is perfect as well. It currently has old pads and it will need a repad. It plays enough now for me to describe the tone– It’s huge, powerful, and will easily fill up a room. This is a great lead alto for jazz, though I have also heard people swear by these for classical repertoire as well. This horn should make somebody pretty happy. It ships in the original case which is in excellent condition. Conn 6M Alto Saxophone Fresh Overhaul Early Example! Conn 6M Alto Saxophone Near Mint + Overhauled Early Example! This is one of the most pristine original Conn saxophones that I have seen. It comes freshly overhauled and in its matching original case. If you have been waiting for an even-more-beautiful-than-usual vintage Conn alto, this is it. It’s also collectible. It is one of the best surviving examples from the very first batch of the 6M “Artist” model Conns, which started at SN#250203, making this (#250243) the 40th one ever! This is a pristine, early silver Conn 6M alto saxophone. It has the rare “Metro” stamp on the body, which is probably something like the VIII stamp that came later to distinguish the best horns. The Conn 6M is probably the alto with the fastest keywork of anything made so far. The ergonomics are great, and you get faster as you get more and more used to them. The tone is huge. You can blow down walls if you want, or play softly and sweetly like a 30’s big band alto player. These horns have great intonation too, so you can even use them for classical if your teacher is open-minded! Conn 6M Alto Transitional 250xxx Great Deal! This is an early 6M-style transitional Conn alto. It is pretty unusual to see same side bell keys this early. This is the earliest non-experimental 6M-style horn that I have seen. Notice also that the left hand pinky cluster is also fully 6M style! Also the rare “1/2 New York neck” (a freshly coined term=no microtuner, but octave key on the bottom), and single wire bell key guard. Pretty cool. These horns are perhaps the most desirable Conn altos for tone, with a bigger and even warmer sound than the later 6M’s but with the fast 6M keywork that everybody loves. This horn can easily fill a room, but it also has a straight-ahead and somewhat focused sound that allows you to keep it under control quite well if you want to. The previous owner used this for classical saxophone, and it does do that well, believe it or not. The intonation is good as well. There’s a reason why people love these transitional altos so much – because they’re great! This is a mint, extremely early, fully 6M-style transitional silver Conn alto. This is the nicest one that I have seen. All that it needs is a repad. It also has the M neck that seems to play the best of all of the transitional necks, and may be equivalent to the VIII necks of later years. This is a beautiful, and great-playing Conn transitional alto SN#260xxx in silver plate. It has no damage, and the pads are in great shape and feel good. It has very little wear to the silver – just on the pants guard and a few touch points. There are no dents or past repairs at all. The original neck (stamped M) is in excellent shape and has not been pulled down. All in all, this is a super-clean transitional alto that also has good pads! These horns are perhaps the most desirable Conn altos for tone, with a bigger and even warmer sound than the later 6M’s but with the fast 6M keywork that everybody loves. This horn can easily fill a room, but it also has a straight-ahead and somewhat focused sound that allows you to keep it under control quite well if you want to. This horn is a very clean, original silver Conn transitional alto in the primo serial range for 6M style transitionals. It has the M stamped neck (which may be the precursor of the VIII). These horns are perhaps the most desirable Conn altos for tone, with a bigger and even warmer sound than the later 6M’s but with the fast 6M keywork that everybody loves. This horn can easily fill a room, but it also has a straight-ahead and somewhat focused sound that allows you to keep it under control quite well if you want to. The intonation is good as well. There’s a reason why people love these transitional altos so much – because they’re great! This is an extremely clean late transitional 6M alto in silver plate. It has no issues at all, and almost 100% of its silver plate intact. All it needs is a repad to be ready to go. See some of the other silver conns in the Museum section of this site if you want to see what it will look like cleaned up. It ships in the original case which is in good condition. The neck is the M stamped one, which seems to be the best playing of the transitional necks. This horn is in line for a repad, but if you want it at a discount to get repadded elsewhere, now’s the time to buy. This is a excellent condition Conn transitional Alto with split bell keys and the rare, art-deco engraving. The deco engraving like this is found only in a narrow range and is highly desirable among players and collectors alike for the beauty it has, and for the unique combination of tonal characteristics these horns have. These transitional Conns are the best of the vintage Conns in my experience. They have a big, warm tone that is perfect for a wide range of playing. You really can’t get a tone even close to this from any modern horn. When you play this sax, the whole body tube shakes in your hands – you can feel the horn resonating with you! It’s an addictive experience, and it shows how special these horns are. You won’t want to play anything else once you get used to this feeling. This is a beautiful example of a Conn Transitional alto saxophone. The transitional Conn saxophones came in a variety of flavors, between around 234xxx-270xxx, and “transitioned” between Conn’s earlier New Wonder II models to their Artist models. See here for more information. This particular horn is one of the most desirable versions of a transitional alto, with the coveted geometrical art deco engraving pattern only seen on a subset of transitional horns (and with a smooth, squared-off G# key at this serial range by the way). This horn has no past repairs, no resolders, body is straight, neck is clean and not pulled down, keywork is mechanically tight and moves freely etc. It has spent its life mostly in its case. Pads are old, and it needs a repad (hence the low price), though you can make saxophone noises on it as is. As Bernie Sanders would say, this horn is huge (yooge!). It’s a very big sounding alto that will blast any modern alto out completely out of the water. This has big player’s value because it is one of the biggest playing 6M’s that I have had, and because it has just been totally overhauled and will hold up very well over time. It has all new pads, corks, felts, keys fit mechanically, everything nicely setup, cleaned and oiled. Maybe it is hard to tell from the photos, but this is one of the most perfect, like new Conn altos that I have ever seen. It comes from a collector in Elkhart, and it is just great– a 10/10 early example in beautiful silver plate. They don’t get much better than this. It’s in as-found shape, meaning I have not swapped out the pads. It actually plays pretty well on them, even though they look like the original pads from 80 years ago. If you want a super-clean 6M transitional that will look amazingly gleaming and brand new when overhauled and gently polished, or if you just want a gorgeous example for your collection while they are still affordable, this would be the one to get. This is my favorite version of the Conn 6M, and if you are looking for a lead alto sound that is much bigger than anything else ever made, this is the horn for you. You really can’t beat this for tone, carrying power, or overall attractiveness of a lead alto tone. The keywork is also very fast and comfortable. There aren’t many altos of precisely this version, and they are among the best altos ever made for jazz and big band playing. If you don’t believe me, come by and you can play my personal alto, which is exactly like this. Conn 6M VIII Alto 309xxx Near Mint Silver Plate! This is a beautiful, all original silver 6M VIII alto. It has all of its original silver plate intact, making it just about as near to buying a new Conn alto as one could hope for. The serial is 309xxx which is an excellent range for Conn 6M’s. It has a rich, lyrical voice, good intonation, and a warm, powerful tone. Many people think of the 6M as a quintessential big band horn, and it can certainly do that well, but it is also much more versatile. You can play everything including classical on a 6M and sound great! It is pretty hard to find a really clean 6M that is not beat up. And it is sooo rare to see one that is truly this nice.